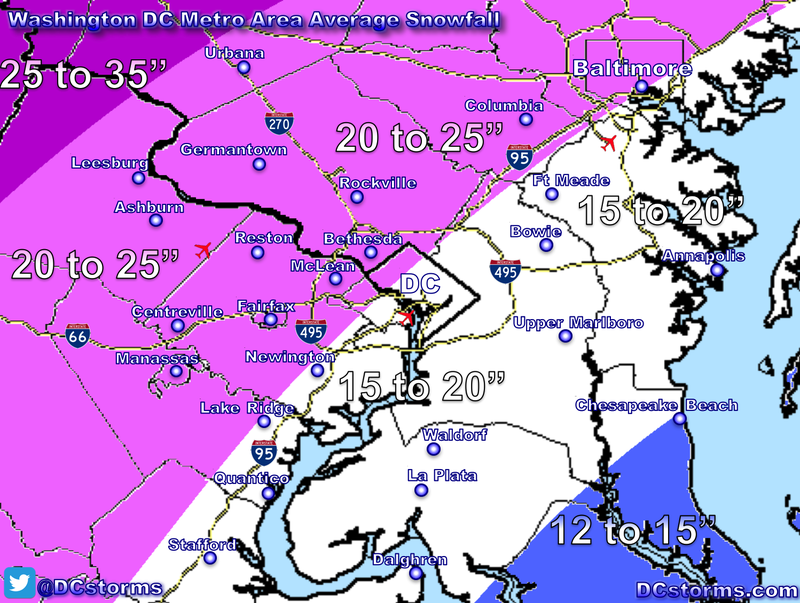 A period of Snow will develop on Saturday during the late morning hours across the Potomac Highlands spreading east across DC’s northern and western suburbs. The snow will change over to freezing rain and then rain Saturday afternoon. 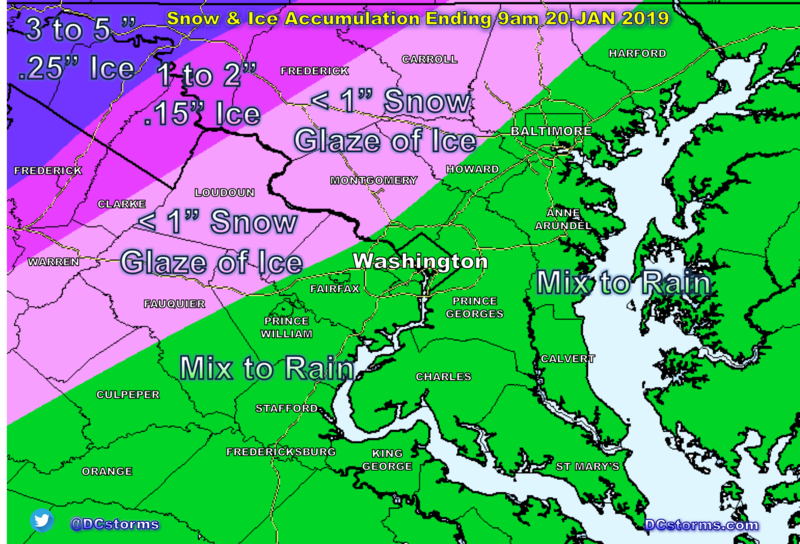 Sheltered valleys across the foothills of the Blue Ridge, Shenandoah Valley and Potomac Highlands may see significant ice accumulation before precipitation finally changes over to rain across much of the region overnight Saturday. Precipitation is forecast to end early Sunday morning. Notice that the North American Model (NAM) below shows snow (blue colors) hanging on across northern Maryland through about 6pm Saturday. The models are notorious for scouring out cold air trapped at the surface too quickly thus tomorrow will need to be monitored closely in case temperatures take longer to rise above 32 degrees (sheltered valleys). Precipitation should come to an end between 6 am and 9 am on Sunday morning. A very well-defined arctic front will blast through the DC region on Sunday causing any wet surfaces that are untreated to rapidly freeze. The image below (courtesy weathermodels.com) shows temperatures crashing from near 37 degrees 5am Sunday to 15 degrees by midnight! Wind chills on Monday morning will be close to ten to as much as 15 degrees below zero in the northern and western suburbs of Washington. High temperatures on Dr. Martin Luther King Jr. Day (Monday) will struggle to rise out of the upper teens across the Washington Region. 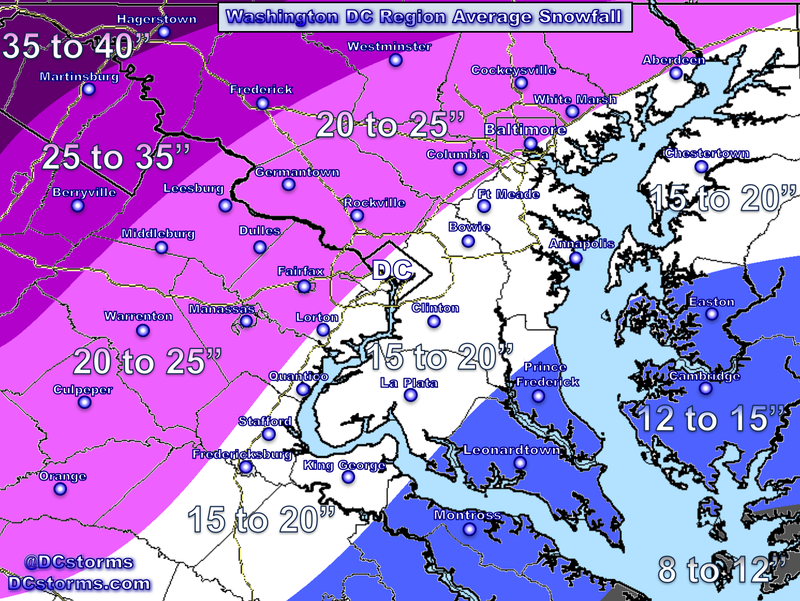 The warmest numbers (likely along the shore of the Potomac) will be near 20 as the National Capital Area heads deep into the ice box.